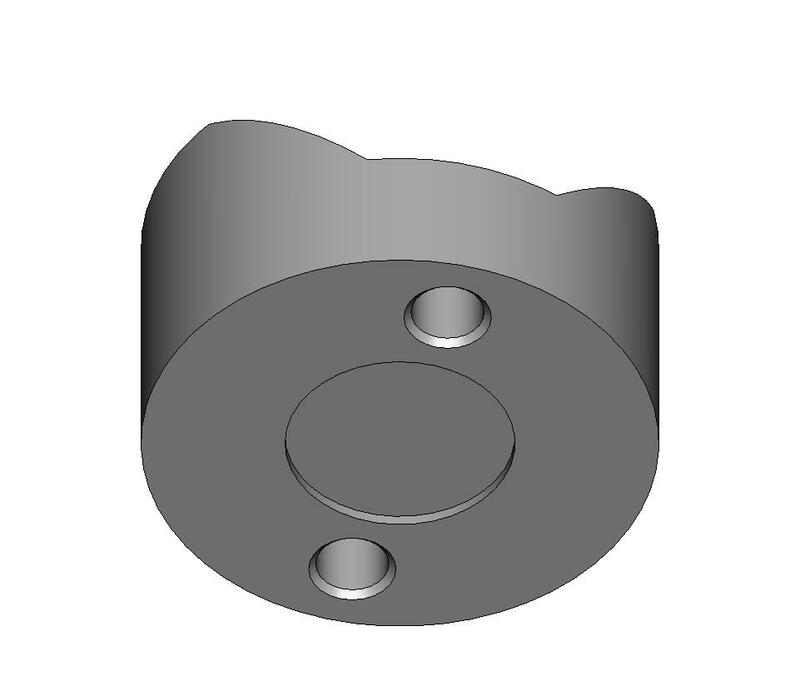 THIS COMPONENT, ALSO KNOWN AS A STANDARD V BLOCK, IS DESIGNED PRIMARILY FOR HIGH LOAD CARRYING KINEMATIC COUPLINGS AND PRECISION TOOLING APPLICATIONS. 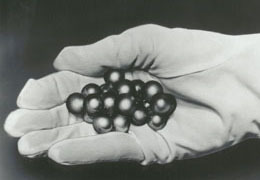 THE CONTACT AREA BETWEEN A SPHERE AND THE PRECISION GROUND FLAT SURFACES OF THE VEE BLOCK IS GREATER THAT THAT BETWEEN A SPHERE AND TWO CYLINDERS. THIS GIVES THE VEE BLOCK A MUCH HIGHER LOAD CARRYING CAPACITY, THAN THE TWO CYLINDERS. THIS VEE BLOCK COMPONENT IS DESIGNED FOR FLAT SURFACE MOUNTING TO THE KINEMATIC OR TOOLING PLATFORM. 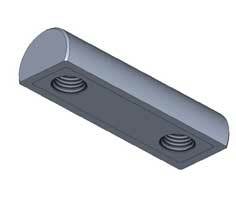 THE PRECISION FLAT LAPPED BASE OF THIS COMPONENT IS HELD IN SOLID CONTACT WITH THE TOP SURFACE OF THE PLATFORM BY TWO CAP SCREWS. IT CAN BE CLAMPED DOWN FROM EITHER THE FRONT OR FROM THE REAR. TWO THROUGH HOLES ARE PROVIDED, ONE AT EACH END OF THE VEE. THEY ARE TAPPED FOR #10 X 32 CAP SCREWS FOR BACK INSTALLATION. USING THESE TAPPED HOLES, THE VEE BLOCK CAN BE PULLED DOWN SOLIDLY AGAINST THE PLATFORM FROM BEHIND. IF FRONT MOUNTING IS DESIRED, THE VEE BLOCK CAN BE HELD SOLIDLY AGAINST THE PLATFORM BY TWO #6 HEXAGON SOCKET HEAD CAP SCREWS. THESE SCREWS WILL PASS THROUGH THE CENTER OF THE SAME TAPPED HOLES BUT FROM THE FRONT SURFACE. 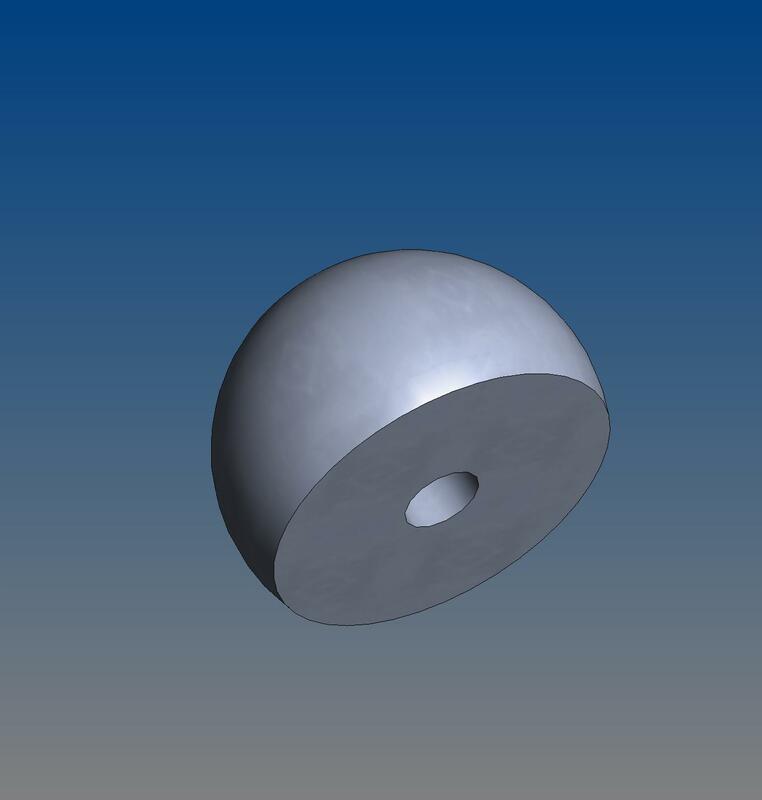 THERE IS A 1/2 INCH DIAMETER SHALLOW COUNTERBORE IN THE FLAT BASE OF THIS COMPONENT. THE REMAINING ANNULAR RING PROVIDES A VERY STABLE LOCATING SURFACE. THIS COUNTERBORE PROVIDES A RECESS THAT WILL HOLD ADHESIVE IF THE COMPONENT IS GLUED DOWN. THESE VEE BLOCKS ARE MADE OF VERY FINE GRAINED, HIGH CHROME, HIGH CARBON, STAINLESS STEEL THAT IS HARDENED TO 58 RC AND ULTRA COLD CYCLED FOR LONG TERM DIMENSIONAL STABILITY. THE 90 DEGREE GROUND FACES OF THE VEE BLOCK ARE TANGENT TO ANY BALL DIAMETER FROM 5/8" (.625 INCH, 15.875 MM) TO 1.00 INCH (25.4 MM), WITH THE IDEAL SIZE BEING 3/4" (.750", 19.05 MM).